Jomo Kenyatta International Airport (JKIA) is the largest airport in Kenya. Its international code (IATA Code) is NBO. 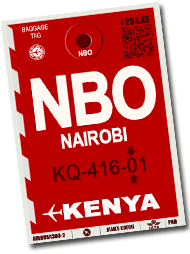 You can see it on your luggage labels when you take a flight to Kenya. On 14 March 1978, construction of the current terminal building was completed on the other side of the airport's single runway and opened by President Kenyatta (photo). After his death on 22 August 1978, the airport, formerly know as Nairobi International Airport, it was renamed Jomo Kenyatta International Airport after the father of Kenya Independence . The airport boasts of over 40 passenger airlines and 25 cargo airlines, has scheduled flights to destinations in over 50 countries. It nearly served 7 millions passengers in 2015, making it the ninth-busiest airport in Africa by total passengers, the Kenya’s largest aviation facility and the busiest airport in East Africa. Traffic at the airport grows at a rate of 12% per annum and is expected to hit the 25 million mark by 2025. It is the hub for Kenya Airways, Jambojet, as well as Fly540 and African Express Airways. There are two terminals. Terminal 1 is arranged in a semi-circular orientation and is divided into four parts: 1A, 1B, 1C, and 1E are used for international arrivals and departures while terminal 1D is used for domestic departures and arrivals. Terminal 2 is used by low cost carriers. The original terminal, located on the north side of the runway, is used by the Kenya Air Force and is sometimes referred as Old Embakasi Airport. The reception of departing and arriving travelers makes of Nairobi International one of the nicest airports in Africa. Accessible sanitary facilities, shops, parking, bars and air-conditioned halls allow passengers to wait for their flight in the best conditions. With a flight punctuality greater than 90%, the Nairobi international airport will guarantee a seamless aerial experience !